“We will respectfully consider all views that are put forward” about the location for the National Aboriginal Art Gallery and its cousin, the National Aboriginal Culture Centre, according to Culture Minister Lauren Moss this morning. But it seems the location will still need to be “at the centre of town”. For most of the two-year wrangle about the positioning of the gallery, the Anzac Precinct was the government’s “preferred location” but last week Chief Minister Michael Gunner signalled a position swap with the Town Council’s civic centre can be considered. Minister Moss spoke with the Alice Springs News Online this morning. NEWS: The Aboriginal people have made it clear that they want the art gallery and the cultural centre south of The Gap. Are you going to take account of that? MOSS: With all due respect there has actually been a whole rage of views about that, amongst the whole community, including the Aboriginal community. We will respectfully consider all views that are put forward. NEWS: Is the business plan for the gallery ready? MOSS: It is in the process of being finalised and will be out soon. NEWS: In a few days? MOSS: Not in a few days. I’m sure I’ll have it within a month or so, and then we’ll be able to talk to the community about that. NEWS: Does it contain a comparison of locations for the gallery? Will it deal with the respective desirability of the locations that have been put forward? MOSS: The business plan will talk about the social, cultural and economic benefits of the gallery. That’s what its focus is on. We are obviously looking for locations where we can maximise all of the benefits in terms of putting art and culture, Aboriginal culture, at the centre of town, but also how we can maximise those economic benefits and those job opportunities. The plan will look at the institution itself. Minister Moss – wearing her hat as the Tourism Minister – hosted a breakfast at the Overland Telegraph Station this morning for volunteer fire fighters helping during and after the disastrous bushfire in the West MacDonnell national park in January. NEWS: Why were water bombers not used? MOSS: Parks and Wildlife, the Department of Environment, Bushfires and the volunteer firefighting brigades have all had their debrief. I have asked for a full review of the response and where we could look to improve. I have not yet received that, what went well and what we can do better. NEWS: You have facilities for water bombers in Darwin. I know you have none here. Will you be looking at putting such facilities here, for aircraft such as Hercules and B737s? They would have been able to deliver vast quantities of water to the fire when it was just six minutes’ flying time away. MOSS: There is a fire management plan for the different parks estates. That is widely consulted on with stakeholders. That’s the plan we follow. NEWS: Does it include the use of fire bombers? MOSS: I would need to check that. I have requested a thorough review. NEWS: There has been much criticism of the lack and type of preventive burning. MOSS: Again, there is a fire management plan worked through with stakeholders. Mitigation is a really important part of that. There is a review into this specific response. NEWS: What’s the best guess about the high value areas of the park affected by the fire, such as the big creek beds – Hugh River, Standley Chasm. Many trees have burned. MOSS: I’ve just had a look at how extensive that fire was. It’s a credit to all of these guys [pointing at the fire fighters present this morning], over 80 respondents to the fires. There wasn’t loss of life or injury, no loss of infrastructure, but obviously across the landscape it has had a really significant impact. NEWS: What’s your best guess about the percentage of the high value areas that have been hit? MOSS: Again, there’s been a debrief and I have requested a review which I have not yet received. NEWS: Can I have a copy when you get it? MOSS: This is something we’re currently doing internally. I would need to consider the recommendations. That is standard across any of these types of events. I am very happy to keep talking to you about what comes up, what more we need to do across the area. I am very confident that these guys have done an incredible job, particularly protecting these tourism assets out there. 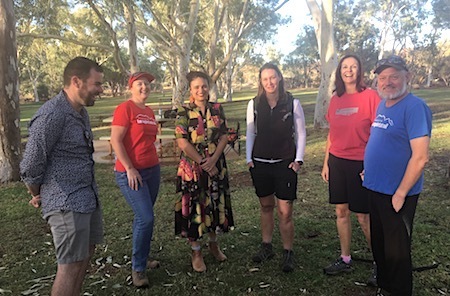 PHOTO (from left): MLA for Namatjira Chansey Paech, Andrea Celofega, Minister Lauren Moss, Karlee Foster, Sue Chambers and Valerian Celofega at the Overland Telegraph Station this morning. Yes indeed, there needs to be an Aboriginal consensus about the site. If the CBD is to be revitaliised it needs people living in it, a gallery open 10-4 will not do much, permanent residents will do a lot more. What about the old drive-in? Do we need another art gallery? There are a dozen in town, and Araluen. What will happen to them? Closing down slowly! Business plan will only tell us how great the plan will be.